I was starting to get pretty comfortable in Olgii. 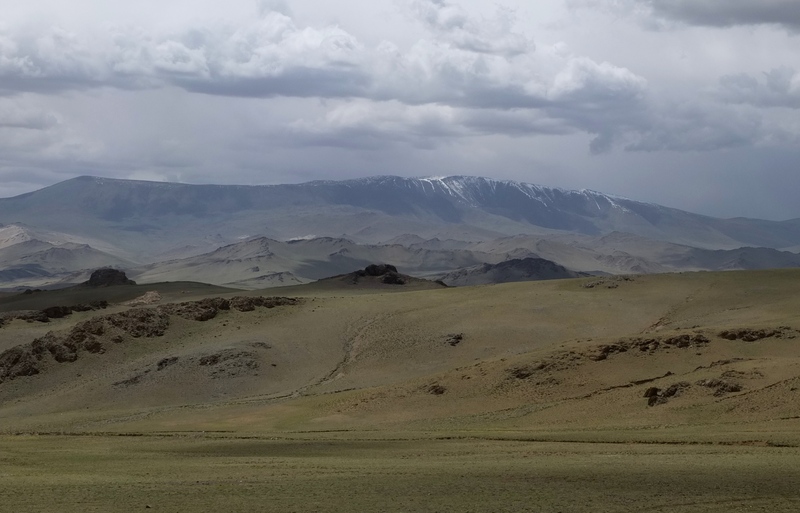 The rough ride from Ulaangom had taken a lot out of me and one day’s rest turned into three. 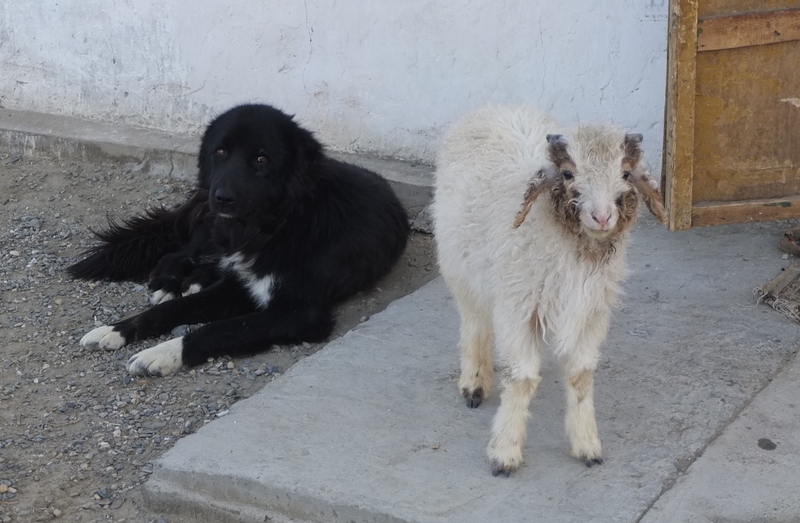 I stayed at a nice guesthouse with a ger to myself and spent a lot of my time resting, eating and surfing the internet. I ate at the same tasty Turkish restaurant called Pammukale every day. 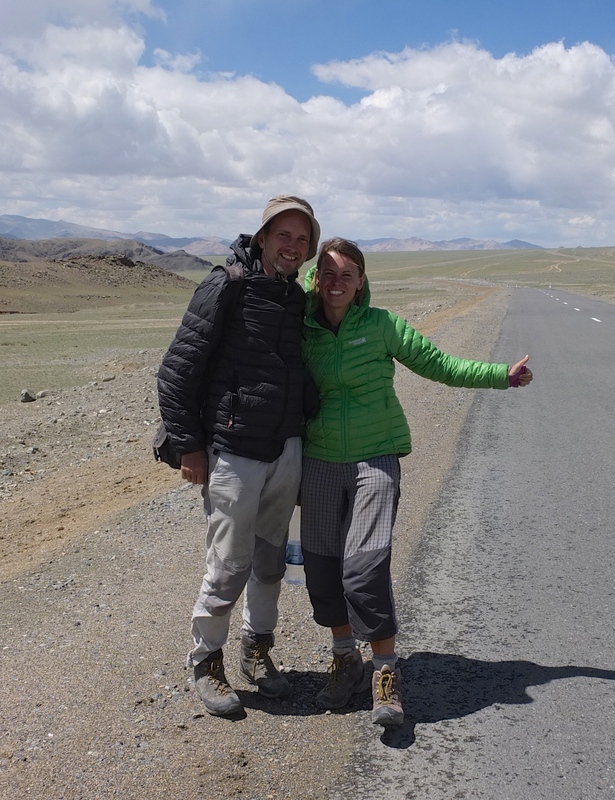 I also met a Dutch couple Anna and Julian who were driving across Mongolia. It was great hanging out with them. I also came across another group from the UK, Ireland and France who had driven across from Europe. Eventually, the day came when it was time to get back on the road. 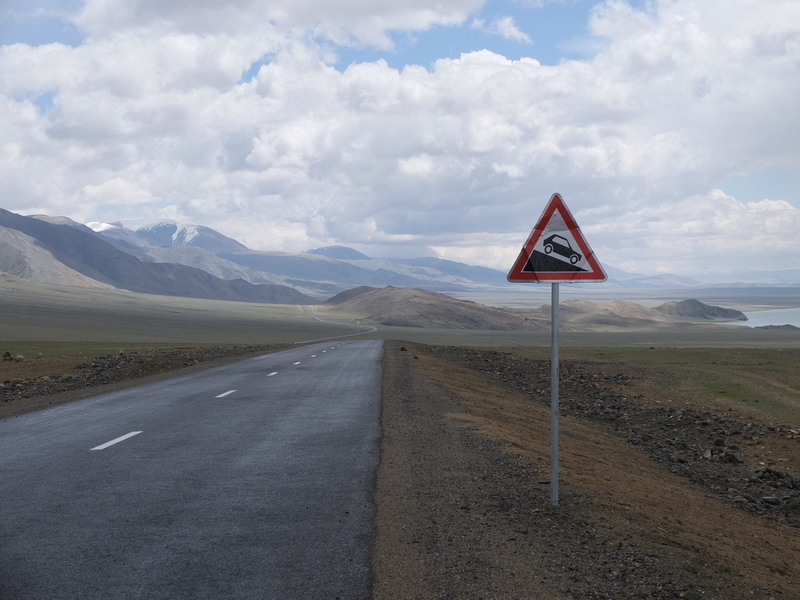 I was spoiled with brand new paved road for the first 60km out of Olgii to Tolbo Lake. One thing I had missed about a tarmac road was the ability to descend at a high speed. On one steep incline with a strong tailwind I hit 69km/hr! I hit 69 km/hr on this descent! Rare photo of me cycling on a rare stretch of paved road. 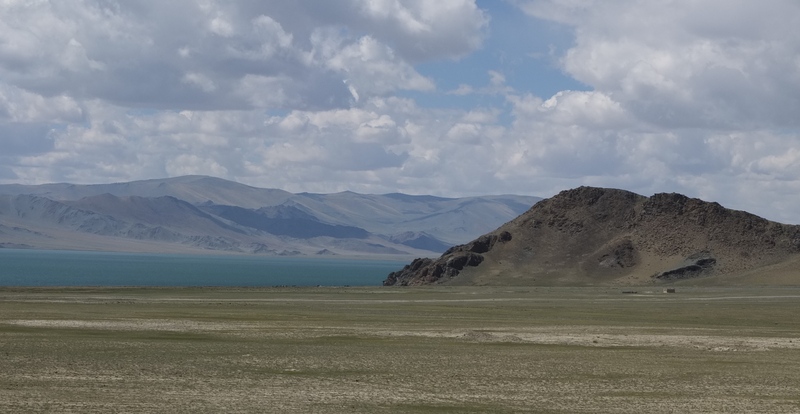 Close to Tolbo Lake, I met a couple from the Czech Republic who had been backpacking around the world for 1.5 years. They were dropped off to do a day hike. They had about one month left of their epic trip before they were returning home. 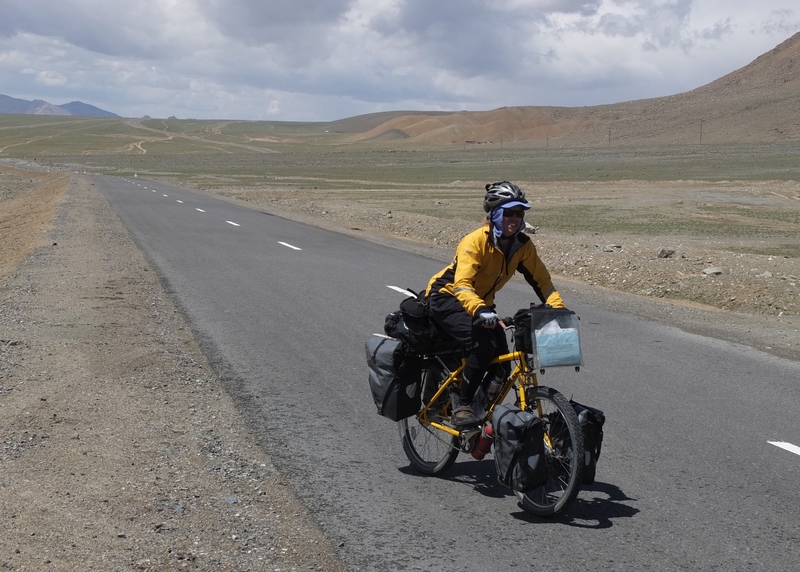 After passing the edge of Tolbo Lake, the tarmac disappeared and the familiar rocks and corrugations began. I passed the small village of Tolbo, which holds a small Eagle festival at the end of September. The largest takes place in Olgii in October. 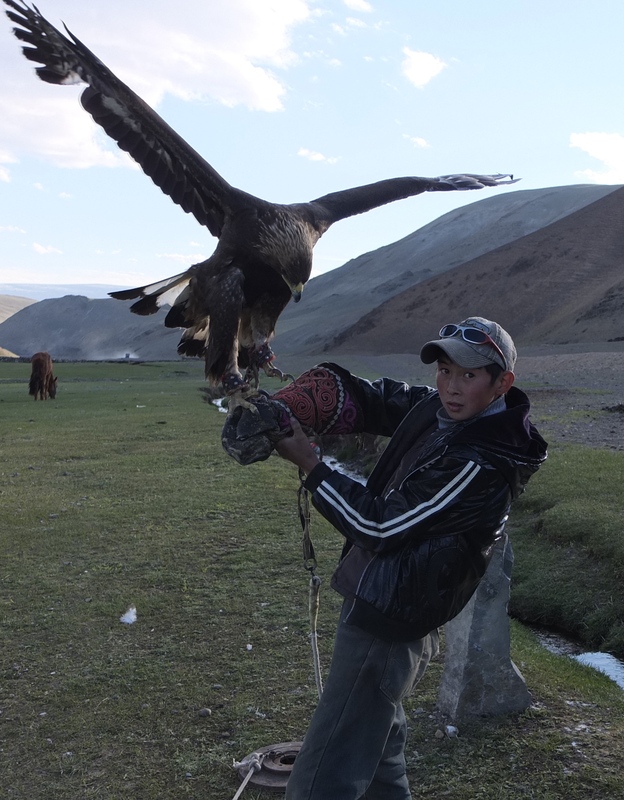 I was in the realm of Kazakh eagle hunters. I was very low on energy at this point and didn’t want to continue much further past the village. 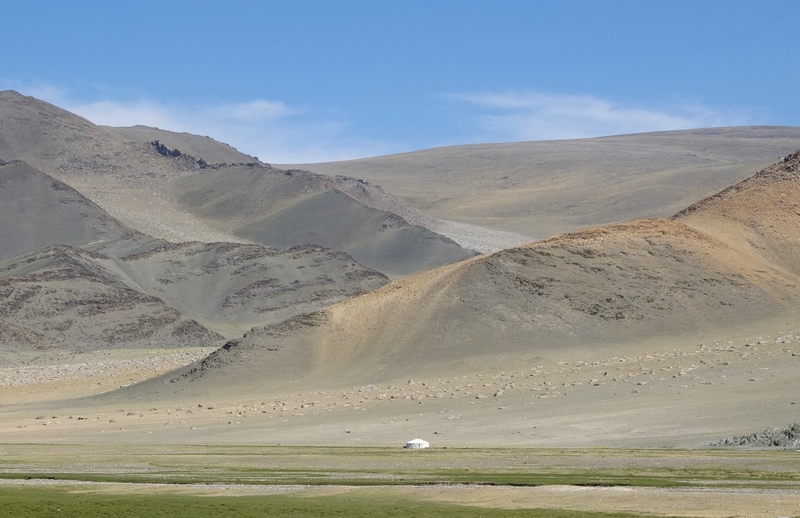 I veered off the main track towards some hills to camp, when a couple on a motorbike waved for me to stop. They asked where I was headed and I mentioned that I was looking for a place to camp. The pointed at the road ahead, saying that there was somewhere to stay in 4km. Then they made flapping gestures with their arms. I was guessing this meant eagles! I decided to carry on. Five kilometres passed and I saw one small cement compound, but no eagles. 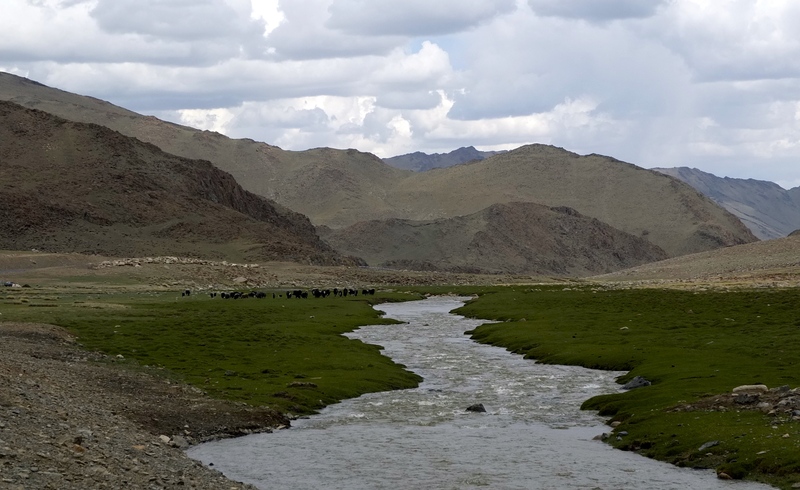 I was too exhausted to keep going and pulled off the road to camp beside the river. While setting up, a boy on horse came over with a man walking beside him. They pointed to the small cement block homes and said I should sleep inside. I took up their offer and they help me take down my tent. 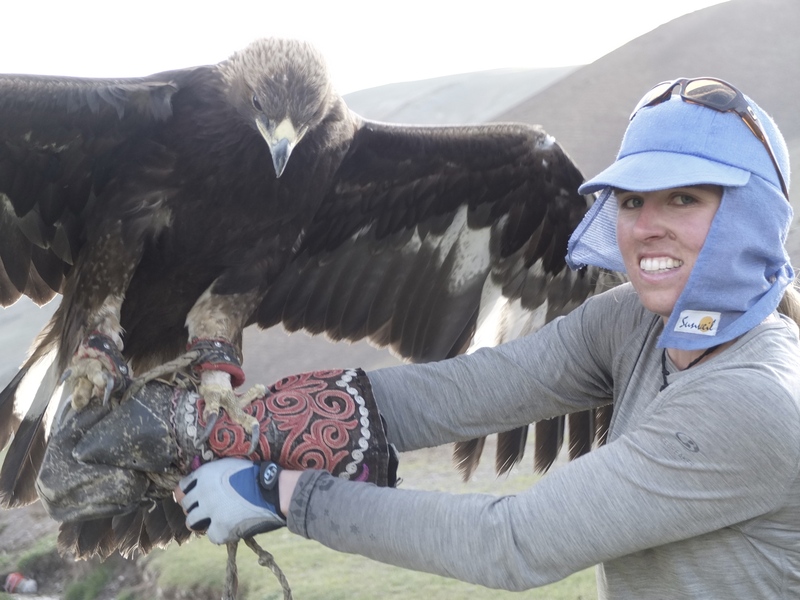 I was in luck because it happened to be a family of Kazakh eagle hunters! Afterwards I saw the boy standing beside an eagle tied to a post. 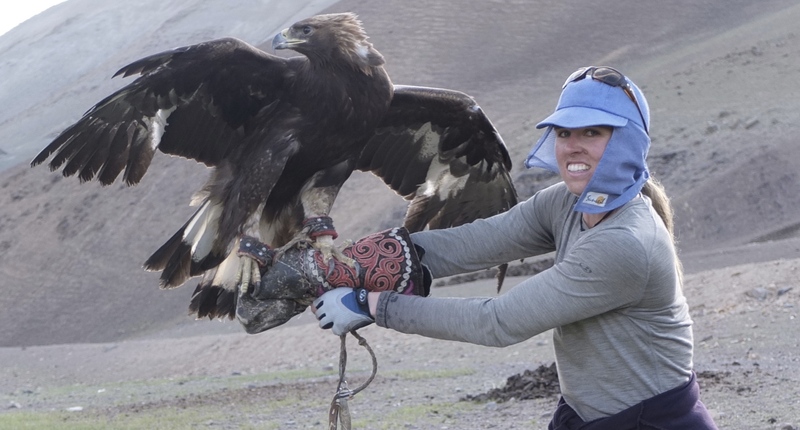 Holding the rope, taut, he got her to perch on my arm, What a magnificent bird! The eagle used to hunt is a burkit, a female. Females are often chosen because they are bigger and more aggressive than males. Training a burkit is a challenging process. She is kept tethered to her pole and taught to chase small skins until she can be trusted to be released to hunt in the winter. Soon, I was invited into the family’s home for some welcoming snacks, tea and vodka shots. Inside, the home was tiny and cosy. This was the first home I had been invited into that wasn’t a ger. There was a small black and white TV opposite the seating area playing a Chinese war show dubbed over in Kazakh. The setup looked like it was right out of the 50’s. The family seemed to have a strong opinion against China, even though they were into their cheesy wartime dramas. There was a small cooking area with the typical ger stove setup and two other tiny rooms. I had a late night feast of my beloved noodle dish, tsuivan, Kazazh style, which seemed very similar to Mongolian. I slept well on the floor that night, sheltered from the wind howling outside. The road followed a river a gradually the condition went from mediocre to deplorable. Sometimes it can be hard to enjoy the scenery when most of my attention is focused dodging the rocks in front of me. 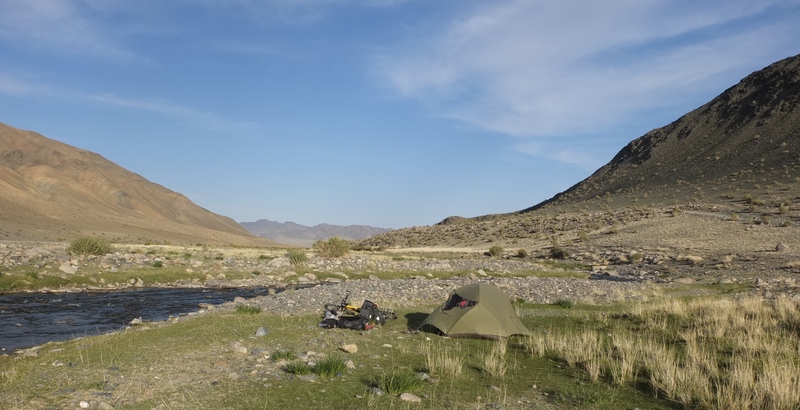 That night I had the luxury of camping beside a river, which isn’t always so easy in Mongolia, where water can be quite scarce. 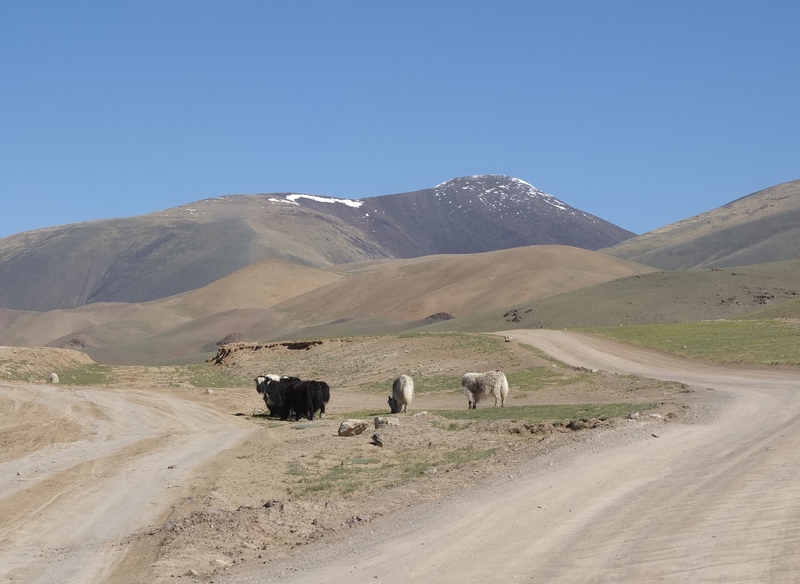 The rest of the ride to Khovd was through more desert like scenery. 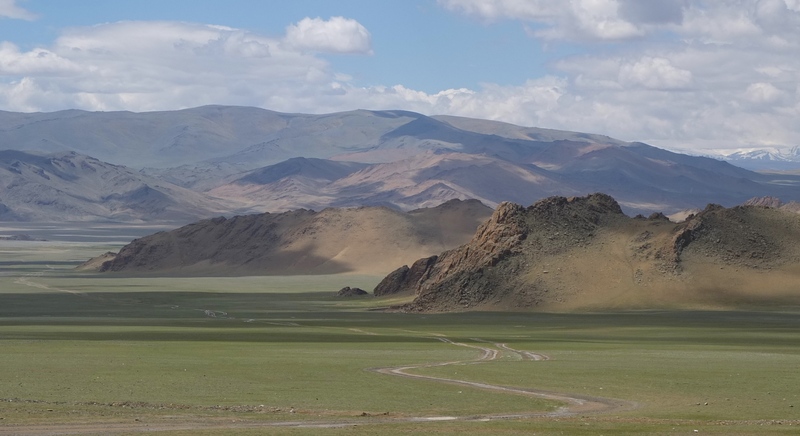 About 20km from Khovd, I unfortunately had a bad encounter with a man on a motorbike. He waved to me while I was riding and motioned for me to stop. I had done this many times with friendly local men travelling on motorbike and horseback, who were eager to say hello and curious about where I was headed. Right away, I had a bad feeling about this one and kept the conversation short. I said bayartai, (goodbye) and starting to pedal away. 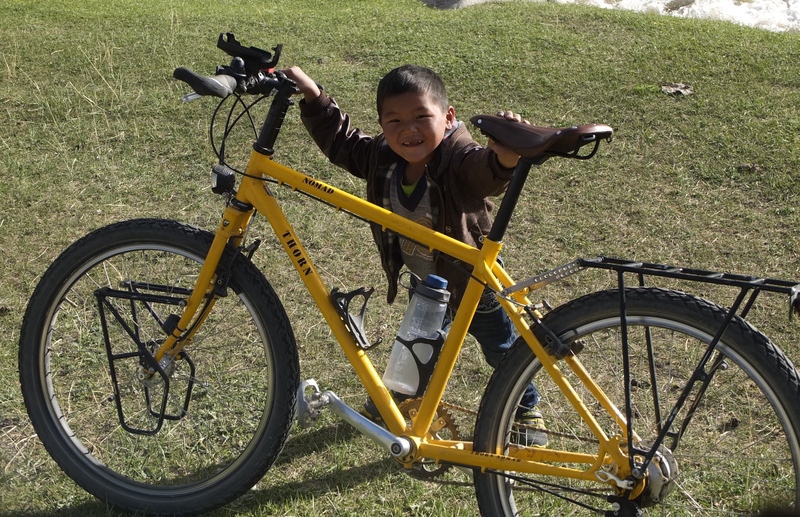 He grabbed hold of my handlebars and bags and tried to stop me from riding away. I started yelling at him and swearing like crazy (wish it could have been in his language). I pedalled away as fast as I could and didn’t stop yelling. He followed me for about 20 seconds and then left. The encounter left me a lot more angry than afraid. It is infuriating knowing there are men out there like that. It was a shock because many of the local men were very kind to me, some trying to protect me as if I was their own daughter. My message to women travelling solo (cycling or not) is this: do not be afraid. I don’t want women to think that it is unsafe for them to travel on their own, but it is important to be cautious and stand your ground. If you are at all uncertain about a situation, GET OUT IT, no matter how rude or abrupt your actions might seem at the moment. Avoidance is key. I will never believe that women should live in fear or that we need to be protected. I wish that a universal society could be created where these men will fear the repercussions of committing such acts. 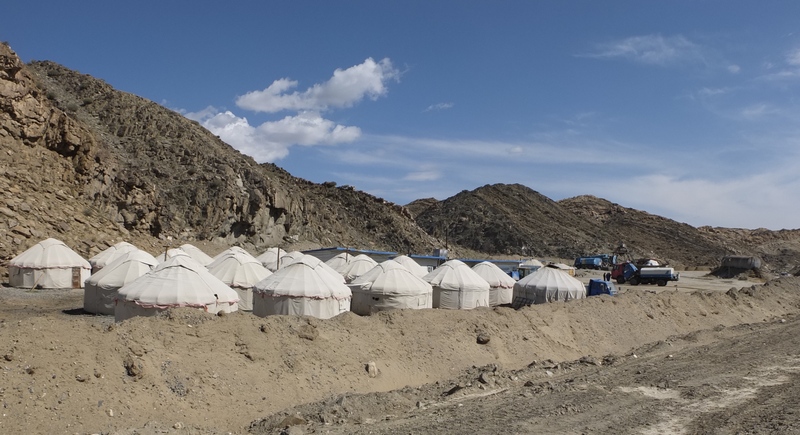 This one negative encounter did not ruin my image of Mongolia and its people. I did, however cycle onwards towards China with slightly more caution towards single men on motorbikes. Back on the road, just south of Manhan, the road began to climb and didn’t really stop for the next 50km. 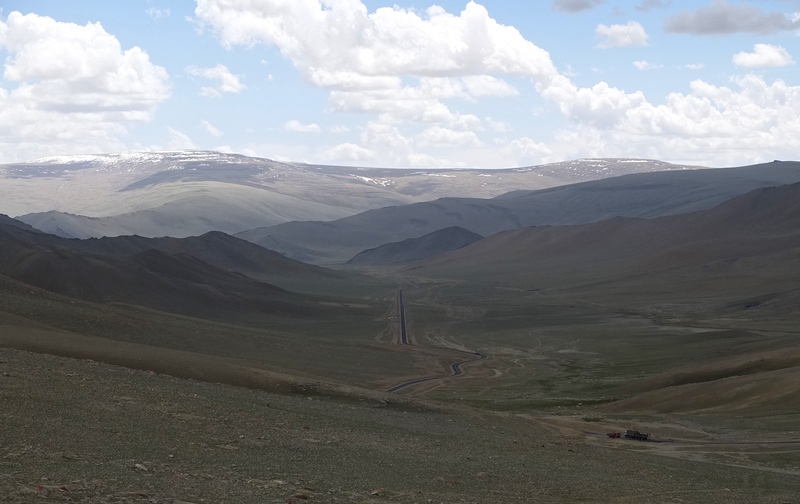 The paved road gave out again and I inched my way slowly up the pass. My mood turned foul and I I was tired of climbing. A group of road workers waved to me and motioned for me to come over. 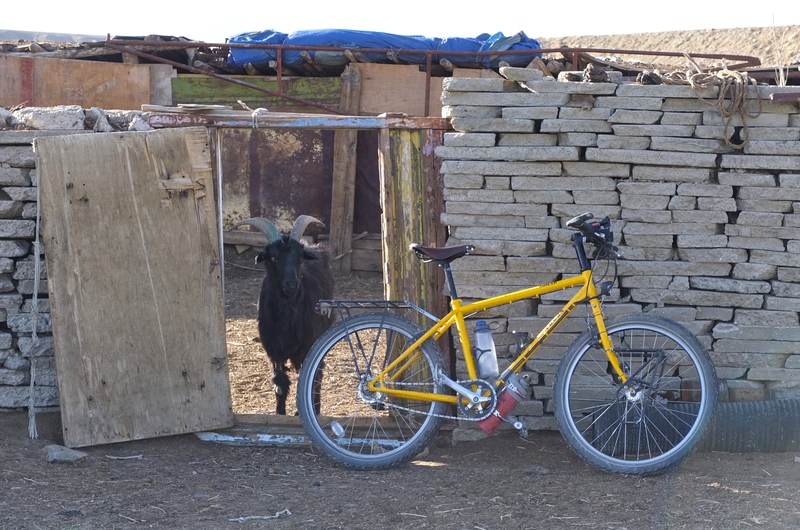 They fired the usual questions at me and curiously inspected my bike, squeezing the tires. 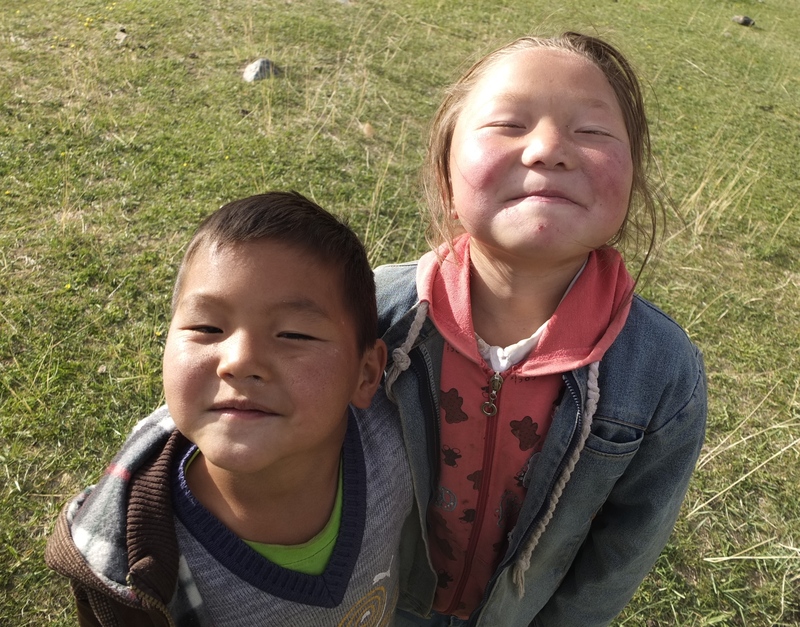 As usual, I could only understand about 10 per cent of what they were saying, but their enthusiasm and positive energy provided me with the break that I needed. In 35km I had already gained about 1000m in elevation. When the road eventually started to descend I decided to camp for the night, only making 50km out of my 100km goal for the day. 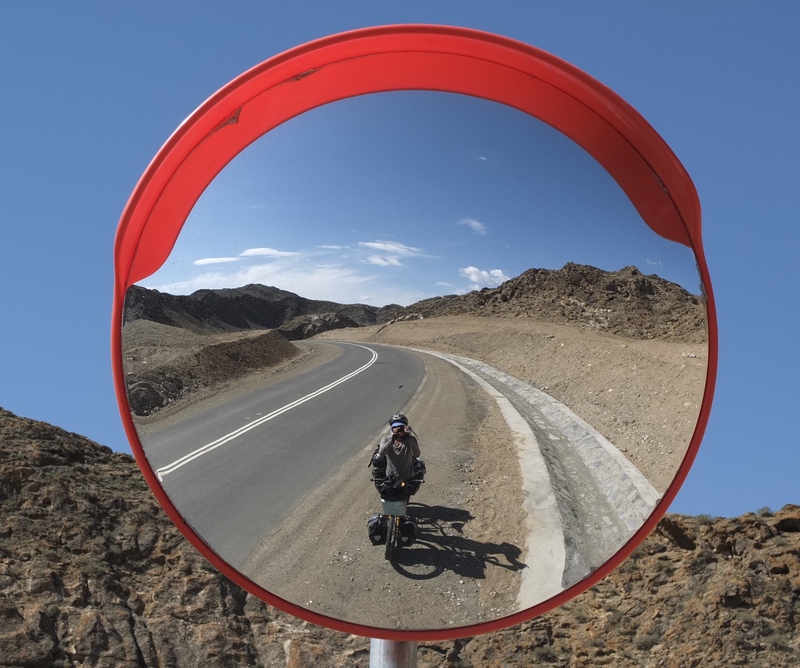 The next day I continued to climb to the highest point I had cycled to in Mongolia at 2850m. Then, the best descent of the trip followed. While the first 50km of the day had taken a great amount of effort, the last 50km took none whatsoever. 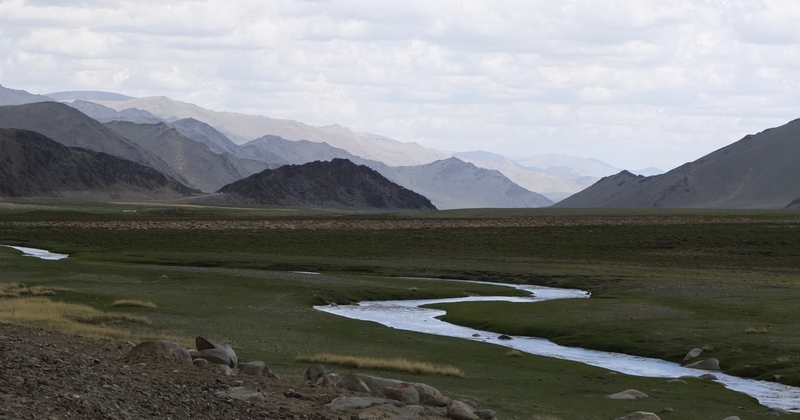 I freewheeled at high speed down the pass and along a gorgeous river. To top it all off I had a screaming tailwind. I passed many gers along the river and decided to stop and ask permission to camp next to one. I met another wonderful family with absolutely adorable kids. The girl was having a riot with my camera, acting like a pro photographer and getting me to do all sorts of poses, while the boy couldn’t stay away from my bike. 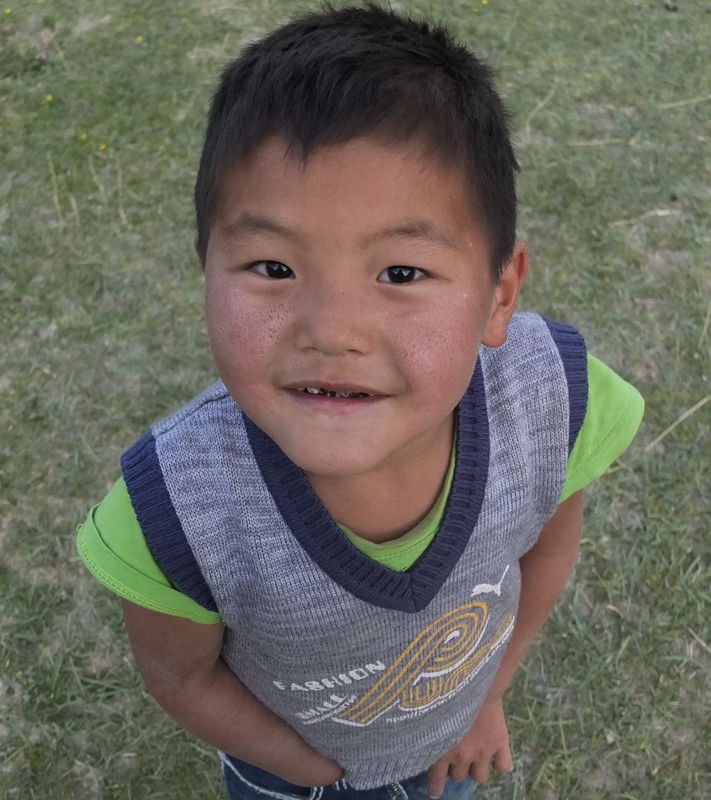 In the last week of my trip, I felt like I could finally get a grasp on some basic Mongolian. It taken me quite some time. I really connected with the mother and wish I knew more of her language. I had mutton dumplings, buuz, made from scratch in their ger that night, which were absolutely delicious. 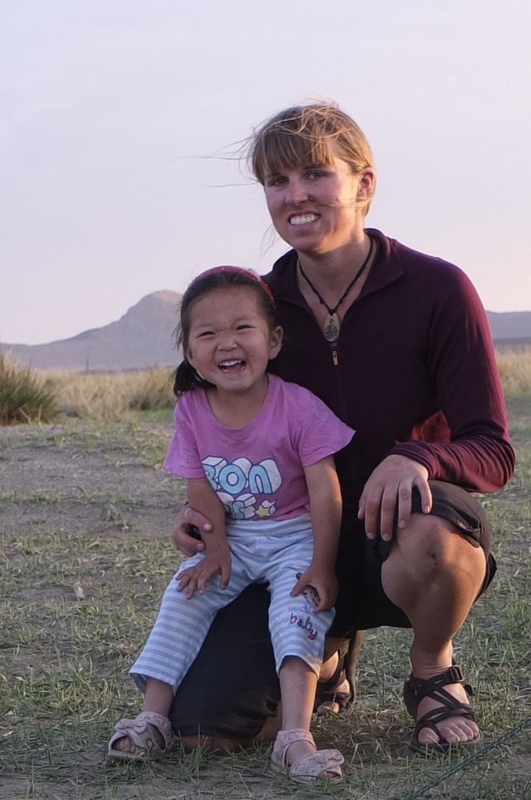 Further up the road in Uyench, I met another wonderful woman and her adorable young daughter. She had the most positive and infectious spirit. When I asked if she was married, it was devastating to hear that she lost her husband in a car accident only a year ago. 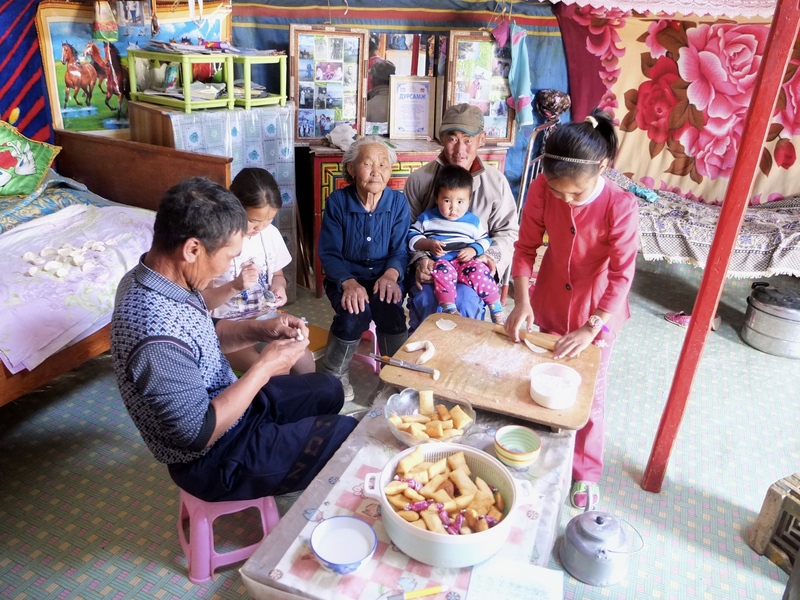 I drank many many cups of suutei tsai (milky tea) with her in her tiny home. We communicated with the aid of my phrasebook and tried to learn as much about each other as we possibly could. 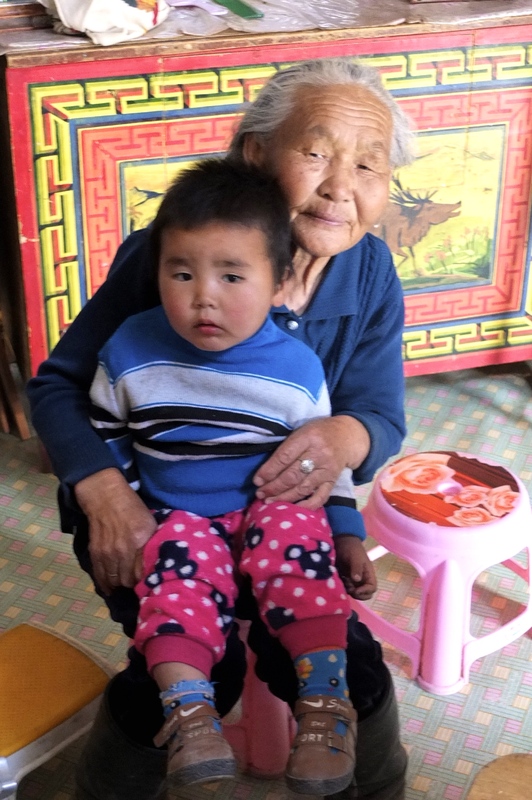 She told me that a typical salary for a Mongolian is only $250-350 USD per month. 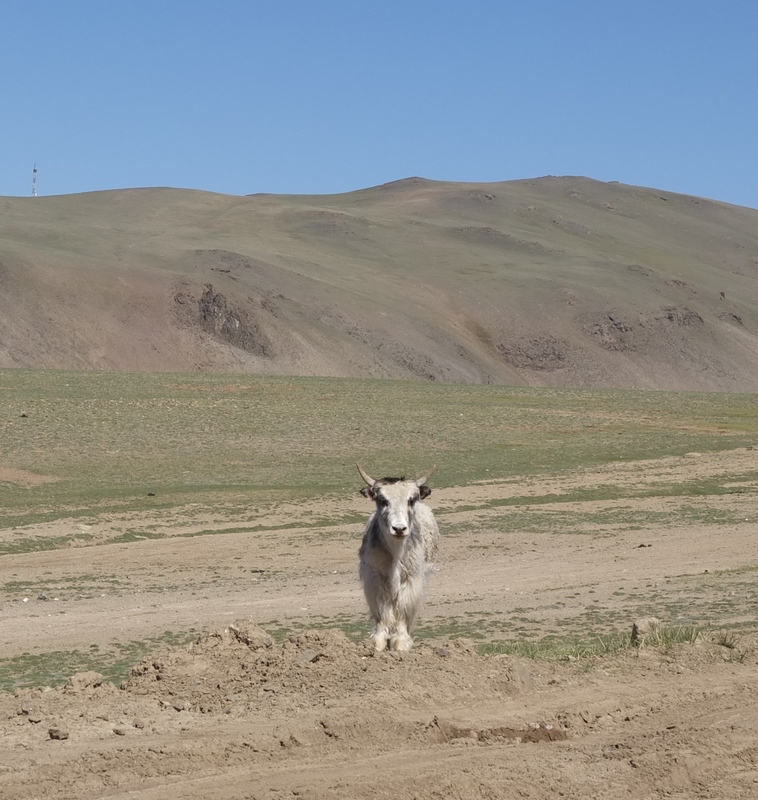 In the countryside, Mongolians and largely self sufficient, raising their own animals and fueling the gers with dung. 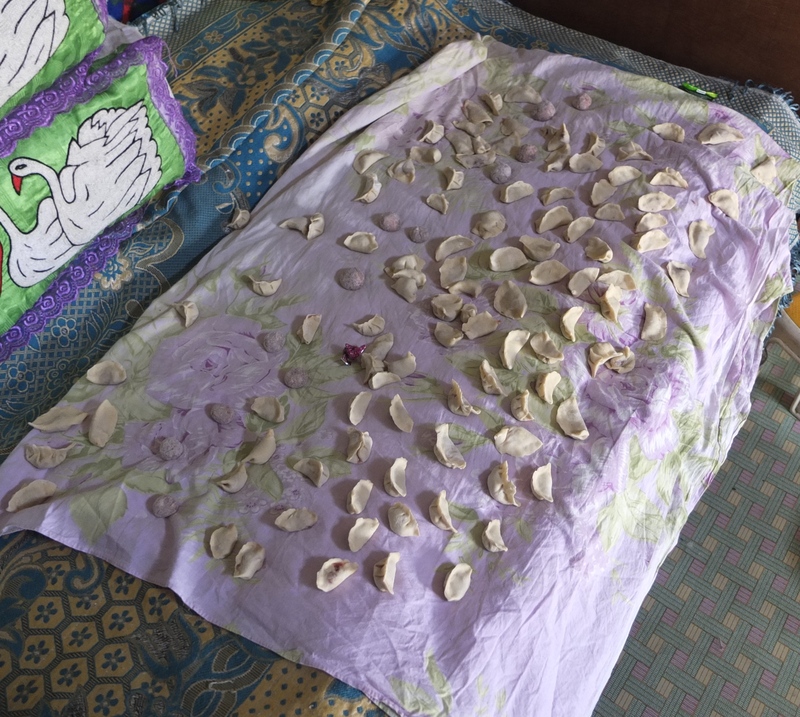 Among the things purchased would be flour to make noodles and fuel for motorbikes. With a move into a town, it becomes much harder to make a living. I have learned on my travels that people who have the least tend to give the most. With all that this woman had been through, her spirit had been unbroken and she had so much to give, even to a total stranger like me that showed up one night at her doorstep. I camped in her yard that night and her and daughter slept in her small car. I imagine she didn’t want to to sleep in her own bed because of her husband. 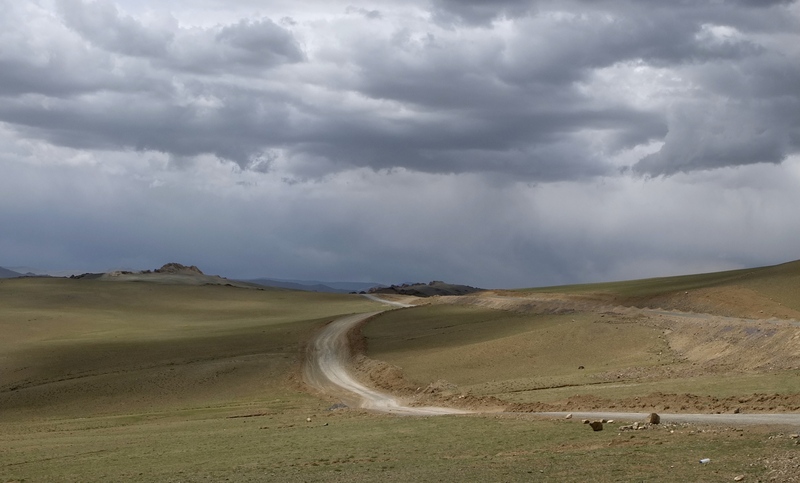 The next morning I left for Bulgan, the final town before the Chinese border. 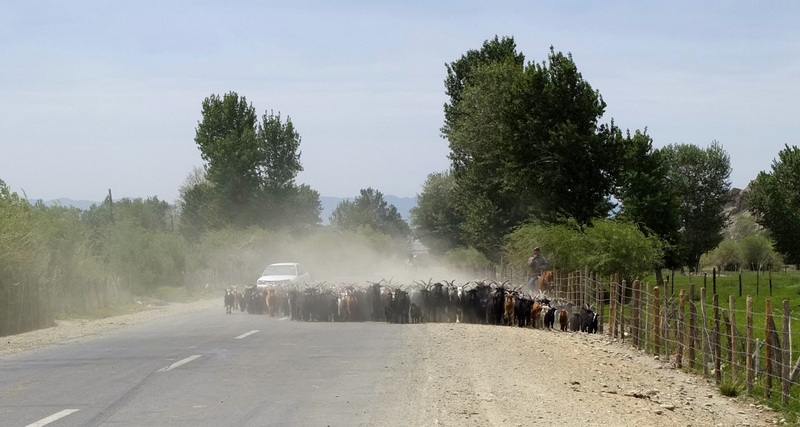 Dirt roads, paved roads…the sheep and goats take over – Bulgan. 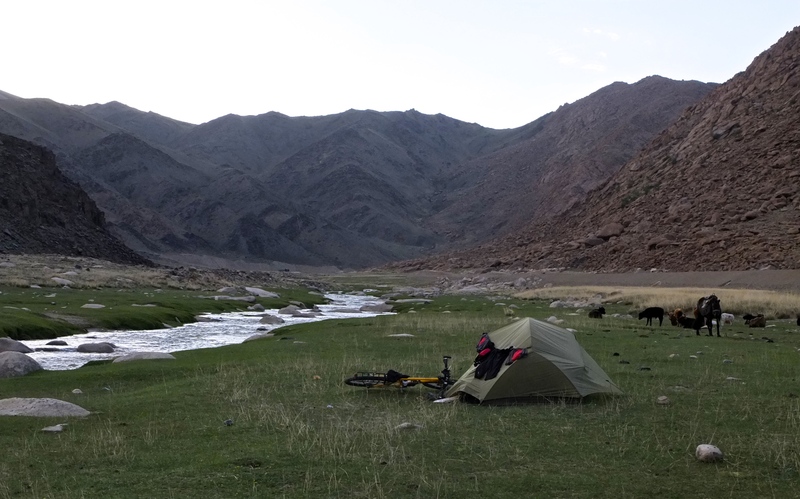 My last night in Mongolia slept in a ger, which seems fitting because my first night cycling I also slept in one. Originally I had intended to camp beside a group of gers. I approached a man and asked if I could put up my tent. He tried to tell me it was too windy (it was) but helped me set up anyway, not needing any instruction. 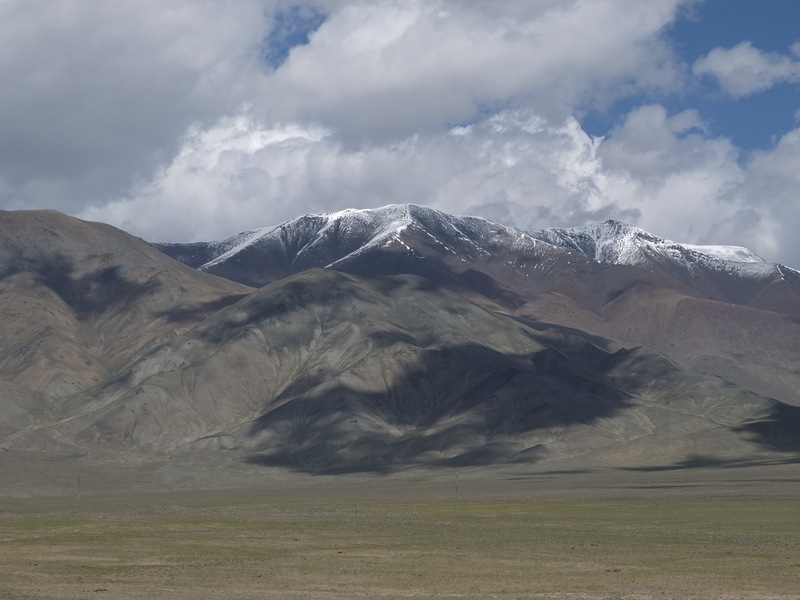 Later on another man approached me from his ger and invited me inside for tea and snacks. Him and his family convinced me to take down my tent and to stay inside with them. So the whole family came out to take down my tent along with the neighbour that helped me setup. 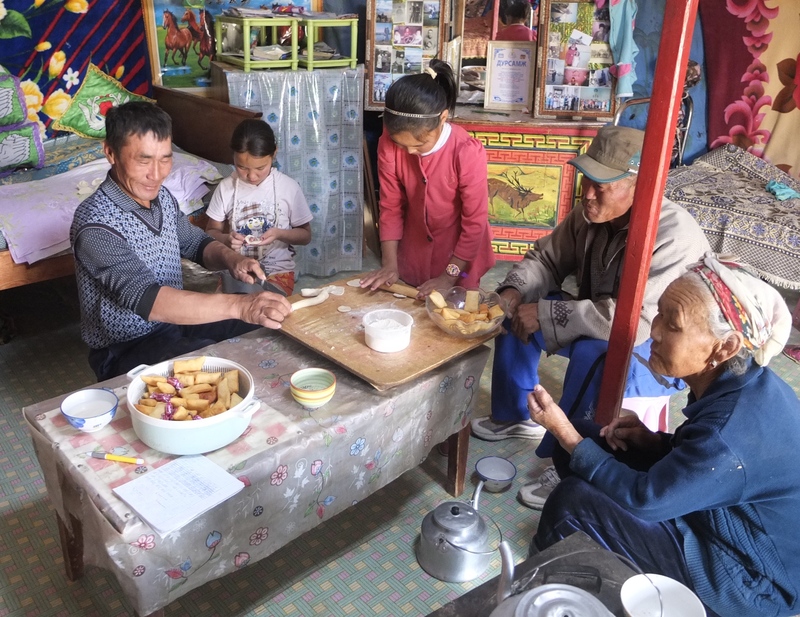 He smiled with the look of “I told you so.” The family made fresh dumplings in suutei tsai (milk tea) soup, which was delicious. 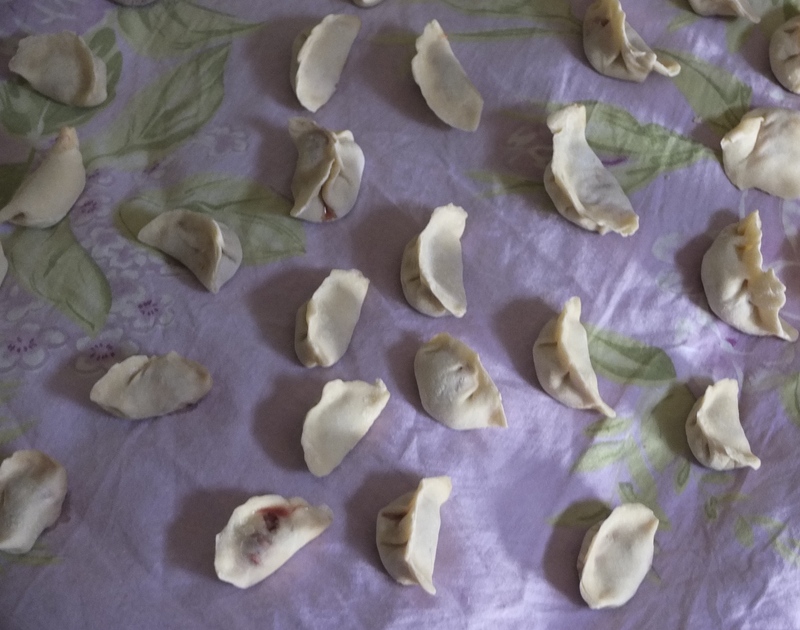 These dumplings were more like the variety I had seen in China called jiaozi and less like the typical Mongolian buuz. I drank another ridiculous amount of milk tea and at this point I feel it will be impossible for me to became lactose intolerant. 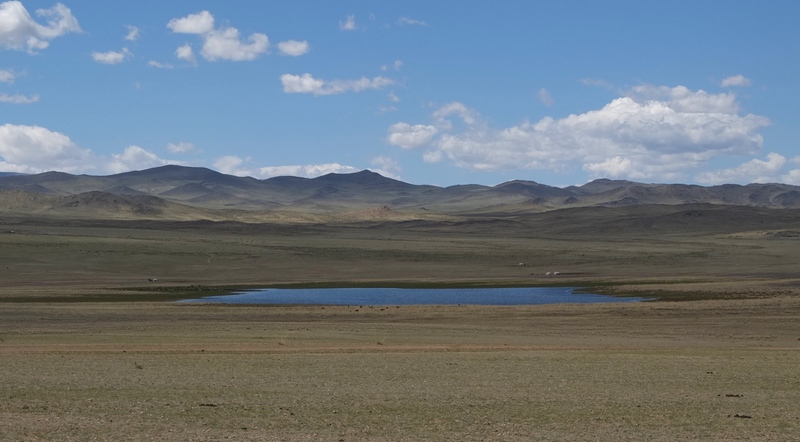 Where Mongolia lacks in Vitamin C it makes up for in meat and dairy consumption. 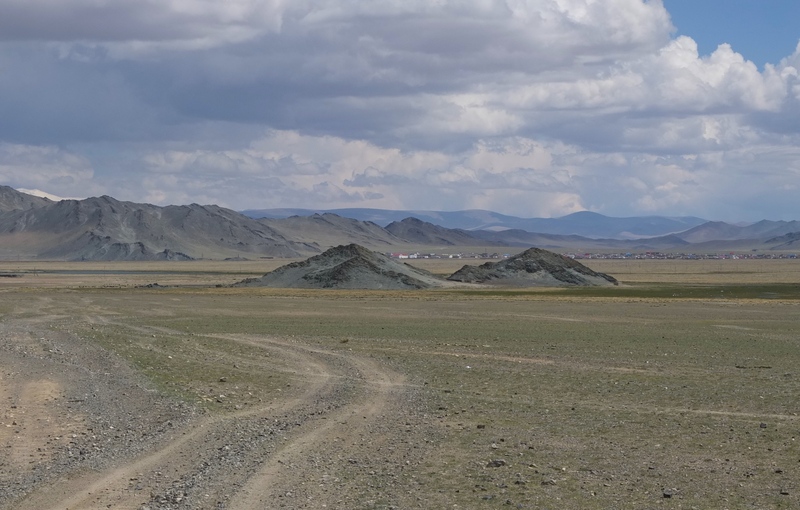 Exiting Mongolia was a breeze while entering China involved a series of thorough bag searches, computer and camera inspections. On the other side I met two cool girls from Singapore that had been working in Mongolia for 6 months and were making their way through China. 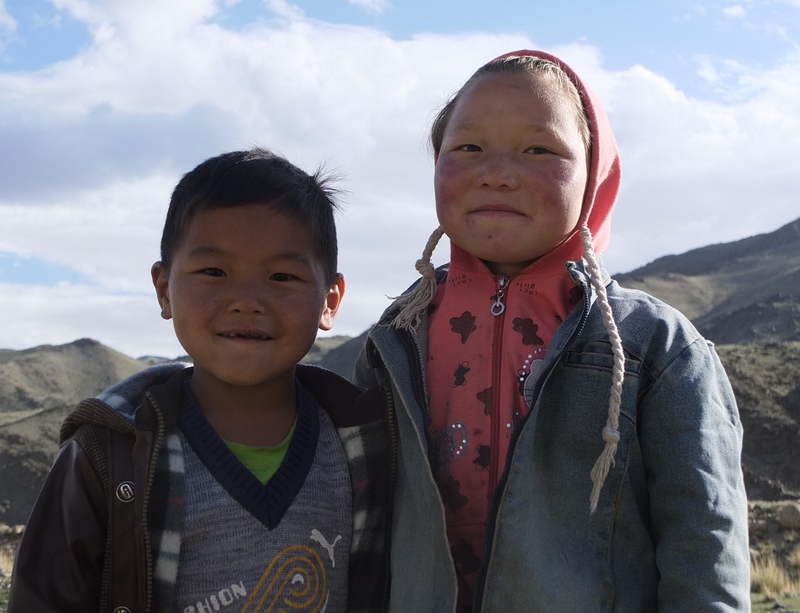 They yelled encouragement from their vehicle as they headed towards Urumqi and me towards the Chinese border town of Takeshiken. I wish that I could have hung out with them longer. 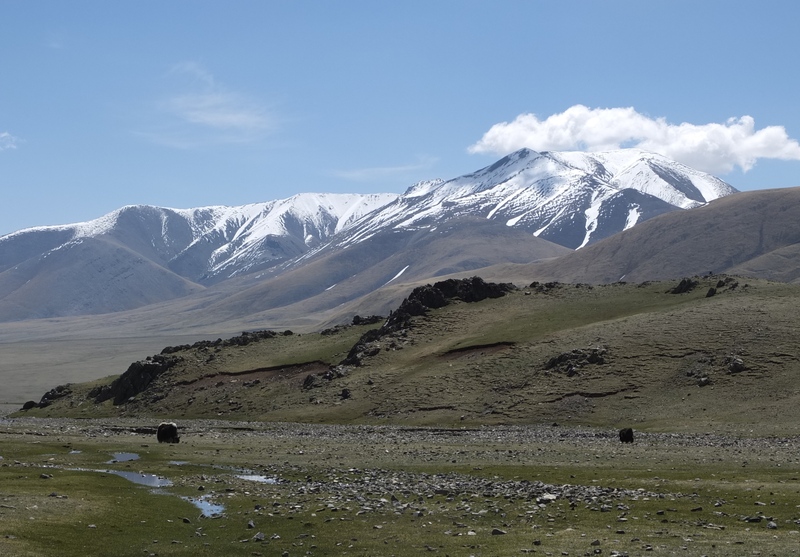 Sitting at my hotel in Takeshiken, I reflected on my journey across Mongolia. What a country. 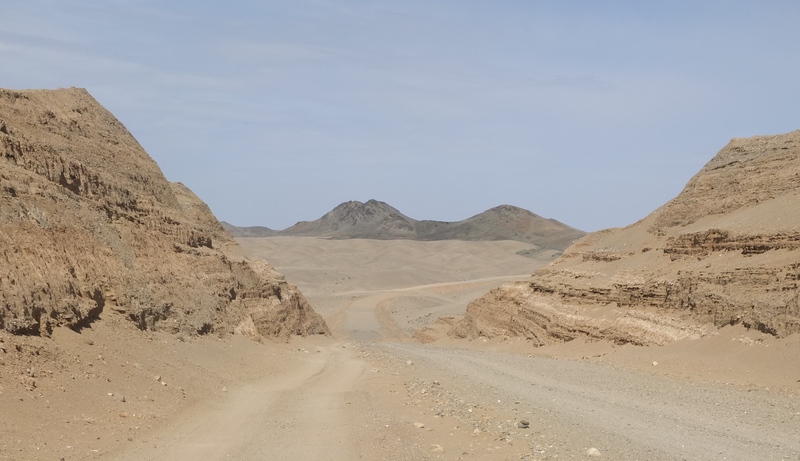 Before I had left Canada, it was the country I was most nervous about crossing, it terms of the rough roads, lack of water and unpredictable weather. While challenging, it was far more manageable than I had anticipated. 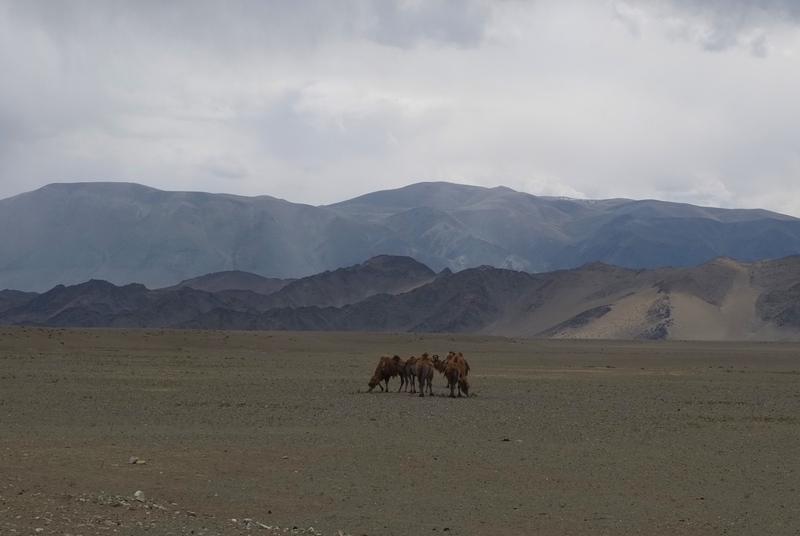 I really miss the wide open, spectacular landscapes and unbelievable hospitality from the people. I don’t think that wild camping will ever get any easier. 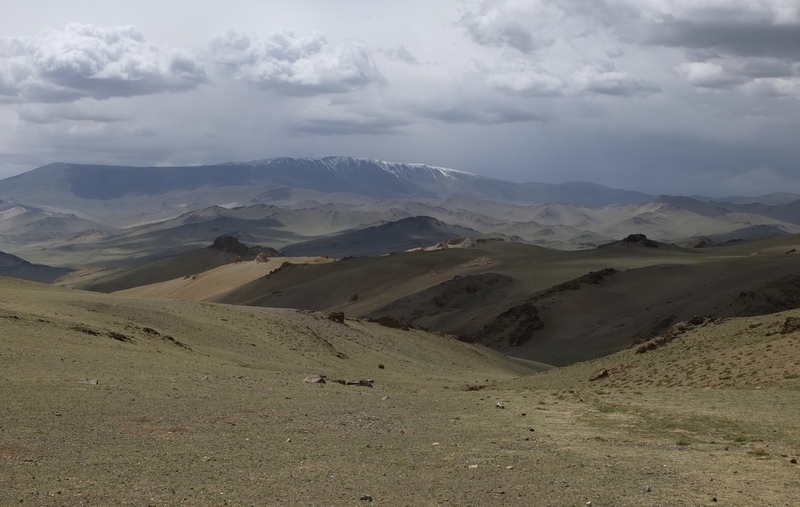 It is one of those few places left in the world with vast areas that still feel truly wild and untouched. 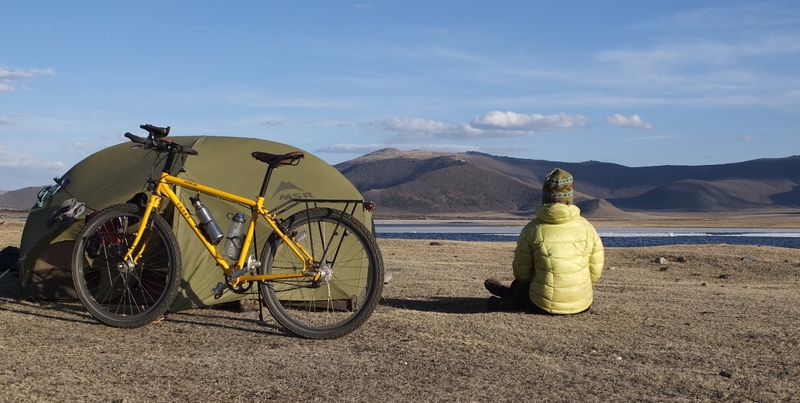 Mongolia is a place that every cyclist should experience. Really look forward to receiving your updates. It must be amazing and I am so jealous. What a fantastic adventure. Stay safe and look after yourself. Love the photos and stories! Hi Tara, your trip is amazing. I am a bit jealous :). We are already back home from travels, so now we only can be your big fans. Where are you right now? Best of luck, Katerina and Petr, “the Czech couple”. Hi Katerina! I apologize that I couldn’t remember your names, so I had to call you the Czech couple haha. Thanks for the compliments 🙂 I am now in Lahore, Pakistan. I will be in India in a few days.